I decided to go ahead and dedicate the week to Ms. Swinton. Why not? She deserves it, don’t you agree? Today I’m shifting the focus a bit away from the actress herself and instead want to talk about a designer who got his big break being associated with Tilda. Besides stumbling upon the Acne Paper spread, I also came across a gorgeous editorial she did last year for AnOther Magazine and on the cover she wore this outrageous fucshia ribbon concoction, one of those things that only Tilda can pull off. It immediately caught my attention and I was excited to find out that it was designed by the new-wave British talent – Craig Lawrence. I’ve had my eyes on this young designer for a few seasons now. 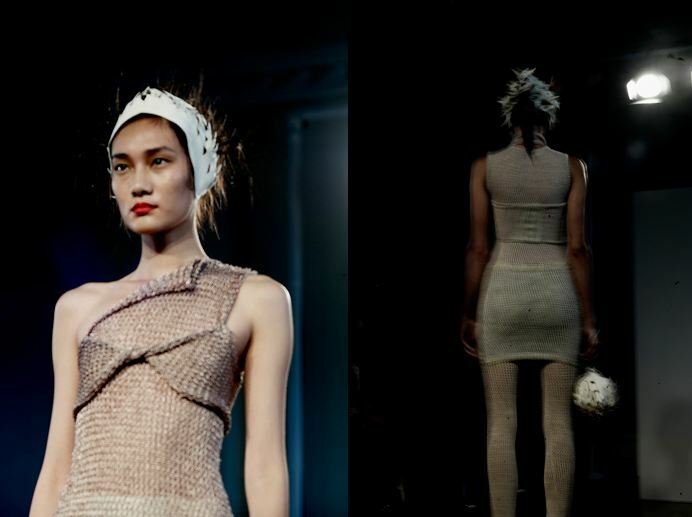 He is one of the few that specializes in knitwear, in fact he is responsible for all the knitwear from the first 6 collections of Gareth Pugh! A Central St. Martins grad, he has been one of the rising British stars alongside such names as Mary Katrantzou, Louise Goldin, J.W. Anderson…etc. His textured and voluminous knits caught the eyes of a few industry folks early on, but when Tilda’s cover hit the stand, the rest of the industry took notice and Craig himself cites that as one of his career defining moments. His recent collections have been moving into a much more wearable and sophisticated direction with the same attention to quality and detail. The SS12 collection featured the same metallic yarn he uses in all of his collections, Kyototex, which is a key component to his signature lightweight knitwear. The collection was rich in texture and the overall muted neutral palette of sand and beige was inspired by the British seaside. I am happy to see that the silhouette is the most wearable it’s ever been while the emphasis on proportion and layering remains a focal point in his designs and aesthetic. 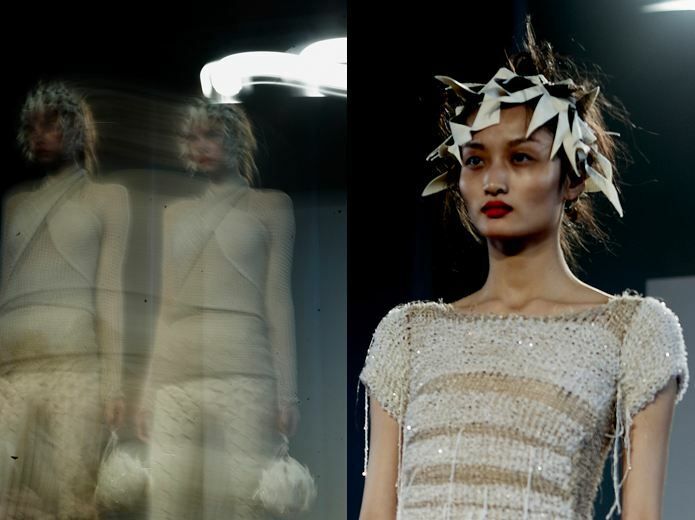 Check out the video of his S/S 12 Collection here. 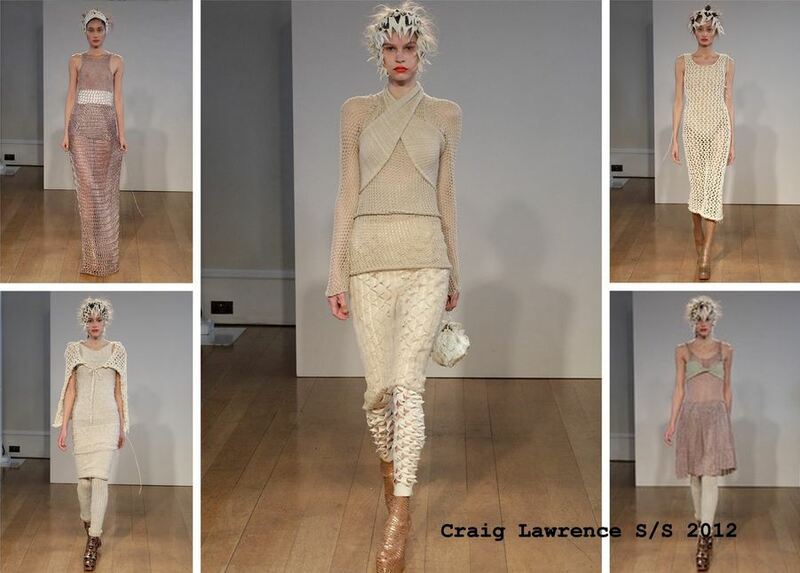 I was so amazed when I saw these pieces up close…truly gorgeous knitwear. I really kind of lost it when I saw this show. With the Fall12 season fast approaching I can’t wait to see what this young designer will deliver. I’m crossing my fingers that another dream fashion moment happens again soon with he and Tilda! Craig Lawrence Fall 2012 fashion Show: London, February 19th, 2012.